An earlier sunset means more time to enjoy the colorful holiday lights around the city! This holiday season, enjoy these 12 festivals, events and illuminated displays in Columbus. 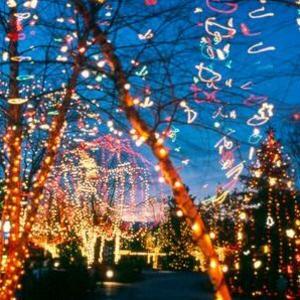 Every year, Wildlights transforms the Columbus Zoo & Aquarium into a stunning array of colors as millions of lights are strung throughout the premises. Visit your favorite animals, enjoy a cup of hot cocoa and catch the regular musical light shows around the central pond. Now in its third year, the Dragon Lights Festival fills the Ohio State Fairgrounds with nearly 40 Chinese lanterns designed by a variety of artists. Stroll through the Natural Resources Park to see brightly lit dragons, tigers, flowers, windmills and more. 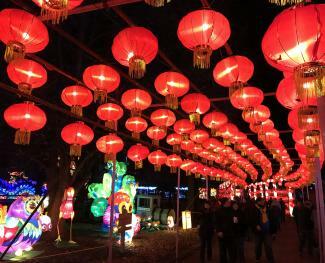 Marvel at the lanterns&apos; size and mix of colors, and stick around for the performances throughout the evening. Named after a long-time Delaware County resident, Butch Bando’s Fantasy of Lights was established in 1999. The three-mile, drive-through light show is located at the Alum Creek State Park campgrounds is open every evening (even holidays) through January 1. The Franklin Park Conservatory’s holiday light show illuminates the building and beyond to the Grand Mallway and the new Scotts Miracle-Gro Foundation Children’s Garden. Explore the lights, vast collections of poinsettias, a model railway and trees made of hand-blown glass ornaments. 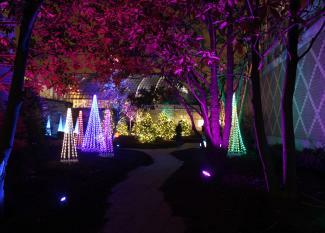 Conservatory Aglow runs through January 2. The Statehouse officially lights their Christmas tree on Thursday, Dec. 6 from 5:30-7:30 p.m. In addition to the tree lighting, there are kids&apos; crafts, holiday music, and a visit from Santa and Mrs. Claus. 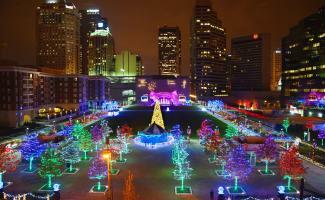 In the evenings through January 2, the Columbus Commons is lit with more than 320,000 twinkling lights! On Fridays in December, you can ride the carousel, enjoy hot chocolate and listen to carolers strolling the park. 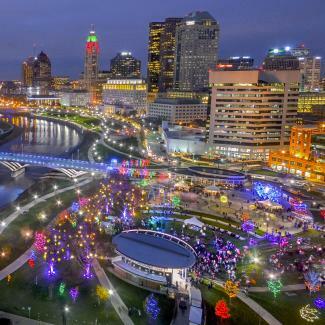 Columbus’ riverfront comes to life with over thousands of lights illuminating the Scioto Mile. See all the lights and take in the beautiful city skyline. Enjoy all of it during the second-annual WinterFest on Saturday, Dec. 1 from 11 a.m. to 4 p.m., with live music, local artists, food trucks, craft beer, and more. State Auto’s annual life-sized nativity display returns at 518 E. Broad St., running through Jan. 2. Catch the official lighting, plus a performance from the on Tuesday, Dec. 4 at 5:30 p.m., or visit on Friday and Saturday evenings in December leading up to Christmas, when local choirs will perform. 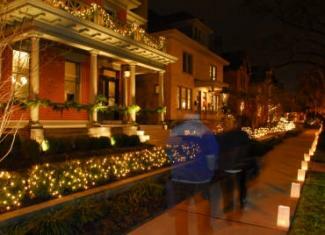 Enjoy the neighborly warmth of German Village during the annual Village Lights, held in 2018 on Sunday, Dec. 2 from 5-9 p.m. Stroll the neighborhood to enjoy rows and rows of luminaries, go shopping in the Munich-inspired Striezelmarkt, listen to Christmas carolers, catch horse-and-carriage rides through the brick streets and taste local snacks and drinks. Take a walk through Worthington’s historic district for an evening lit by luminaries while visiting the local shops, restaurants, and galleries of the area. The annual event is held this year on Thursday, Nov. 29 from 6-9 p.m.
Columbus City Adventures offers a special Holiday Lights Tour around downtown Columbus. Guides will discuss the history of holiday traditions in the city while you visit light displays at the Columbus Commons, Scioto Mile, and Christmas Corner. Let someone else do the driving while you enjoy holiday lights! 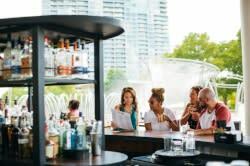 Grab some drinks and book a seat on a trolley tour to see Wildlights at the Columbus Zoo, residential lighting displays around Dublin and Upper Arlington and lights along the Scioto Mile and Columbus Commons.